OYSTER OVERGROWING A PSILOCERAS - JURASSIC SOMERSET. Liostrea irregularis (Munster) on Psiloceras planorbis (Sowerby). 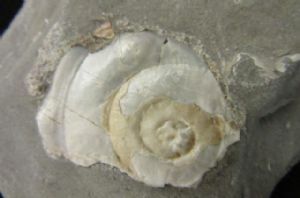 A rarely preserved example of an oyster that has attached itself to an ammonite initially as a hard substrate. As the ammonite has grown the oyster has morphed itself to the shape of the ammonite's shell. This sort of parasitic existence may have benefited the oyster but must have seriously affected the general mobility and stability of the ammonite.